Neem is the King of Herbs and there is no doubt that the soaps made with neem can protect you r skin forever. Be it skin rash, allergy, infection, acne, pimple, itching, Neem can solve your problem quite easily. It is good to crush the neem leaves with water and make a paste out of it to apply on the affected area. But not every one have access to neem leaves. If you are someone who does not have access to fresh neem, Neem soaps are the solution. Why Neem Soaps are considered to be the best bathing soaps - Top 10 reasons why neem soaps are the best soaps? Helps to protect your skin from skin infections and skin inflammations as neem induces nutrition to your skin and helps to improve your skin's immunity. A Unilever product, which is a household name for many decades. Its ingredients are tulsi, aloe vera and neem and are just great to protect skin from rashes and allergies. Right now, I am using Pears soap just for a change. But we have used Hamam for many years from childhood. 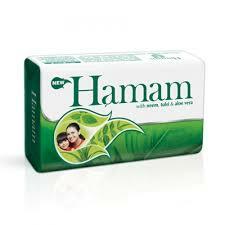 What does the company claim about the soap - Hamam Soap Benefits? Power-packed soap with tulsi, neem and aloe vera. Eliminates germs and skin impurities. Offers a smooth and naturally happy skin. Perfect pick for enriching and refreshing bathing experience. Main Ingredients: Neem, Lemon and Turmeric. 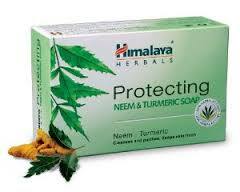 What does the company claim about the Himalaya Neem Soap - Himalaya Neem Soap Benefits? Protects your skin due to its antibacterial activites. Turmeric Nourishes your skin and improves complexion. It also has antiseptic properties that protect your skin. 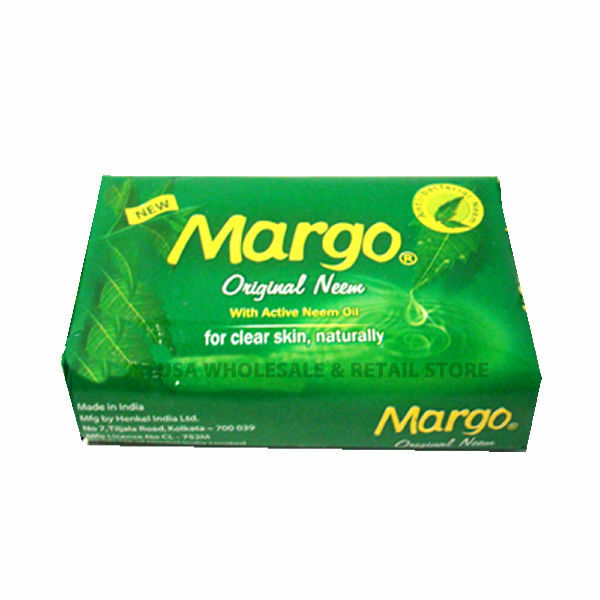 Margo soap is one of the best neem soaps in India and it has been one of the top selling soaps in India. Margo has been available since 1920 in India. It is infused with 100% neem oil and Vitamin E.
The best extracts of natural herbs are used in this soap. Also modern technology has been combined along with Ayurvedic science to offer the very best to customers. For refreshing the mind and to enhance complexion, lemon and turmeric have been used. 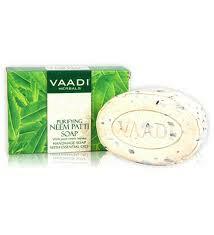 Vaadi Neem soap Price - 155 INR for Pack of 5. What does the company claim about the soap - Vaadi Neem Soap Benefits? This soap is hand-made soap with essential oils. It is 100% paraben free and for offering balanced chemical composition has been tested several times. It is termed to be just wonderful for those having sensitive skin and is acne prone. It contains Neem leaves, Neem oil, Coconut Oil and Rose Water. This is one of the best neem soaps that can be used by both men and women for bathing. It can be used both on face and body. Khadi Neem Soap Price - 60 INR for 125 grams. 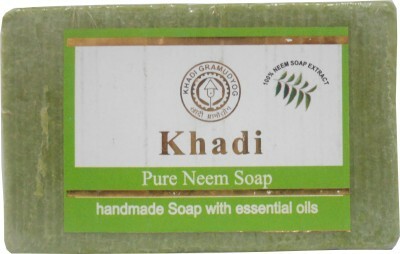 What does the company claim about the soap - Khadi Neem Soap Benefits? Patanjali Kanti Neem Cleanser is from the company of Baba Ramdev. It is a handmade herbal soap. It is one of the cheapest yet quality neem soap available in India. Patanjal Kanti Neem Soap Price - 15 INR for 75 grams. 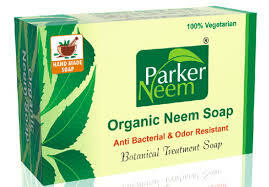 Parker Neem soap is 100% vegetarian soap. Main Ingredients - Neam leaf extract, Neem oil and Neem bark powder. What does the company claim about the soap? Fights body odor, skin infections, skin diseases and common ailments. It is one of the luxury bathing soaps available in India with Neem as one of the main ingredients. The price is more as it is a luxury soap. It has various powerful ingredients. 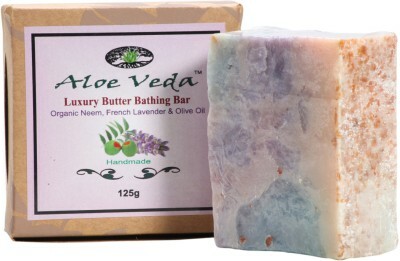 Aloe Veda soap Price: 200 INR for 125 grams. It is enriched with Orange, Cocoa Butter, Lemon, Palm Kernel Oil, Honeysuckle, Olive Oil, Mogra, Citronella, Neem, Almond Oil, Mixed Fruit, Lavender, Wheat Germ Oil, Glycerin and Peppermint. 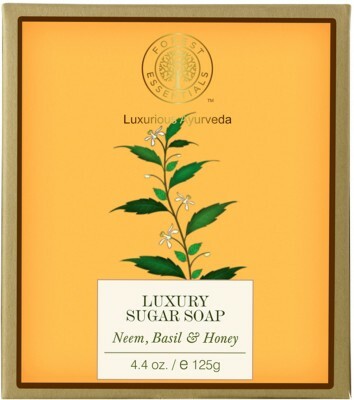 What does the company claim about this neem soap - Aloe Veda Soap Benefits? Has Antiseptic and Anti-inflammatory properties. Cures skin burns, acne, insect bites, stings, sun damages and infections. This is again a luxury soap which is expensive in the market. Forest Essentials Soap Price: 395 for 125 grams. There is no fillers used. 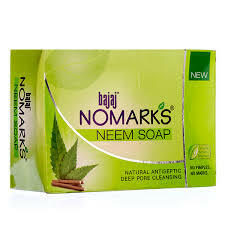 Bajaj Nomarks Neem soap is one of the soaps which has goodness of neem. Provides relief from sun burn, blemishes and acne/pimple problems. Contains Neem which is an antibacterial and powerful healing agent. Prevents and treats itching, rashes, acne and other skin ailments. The above are the top 10 neem soaps available in India that are popular among Indians. Share your experiences with neeem soaps with us. I have ringworm on my body,which neem soap should I use? Ring worm is highly contagious.. It can spread to other parts of body and other persons easily. Do not try to cure yourself if it is not in the initial stage. Consult a doctor/dermatologist immediately. They will prescribe appropriate soap, ointment and medicines to stop it completely. Do not delay it. It is really an irritating problem. Only in addition to this, you can use home remedies. This is my personal experience.. I got ring worm from another person by sharing towel... the worst ever skin problem it is..